Despite all the rain, Seattle has some amazing sunset views. Here's where to find them. 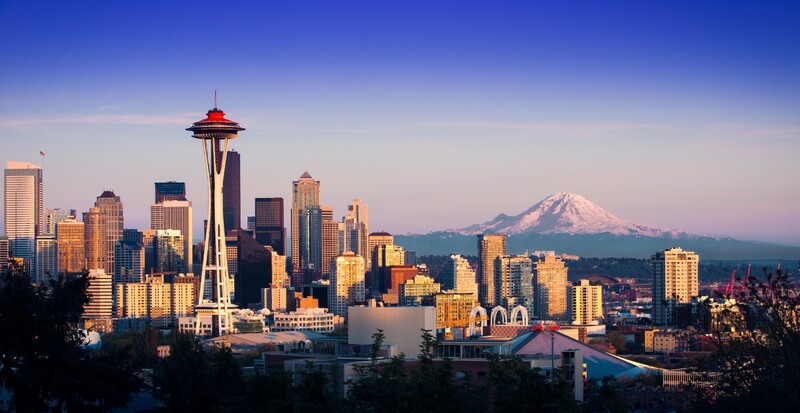 Seattle, or Emerald City, isn’t exactly synonymous with an overabundance of sunshine. Yet, many people might be pleasantly surprised to learn that some of the country’s greatest spots for afternoon photography are found here in the seat of King County. Sunset views in Seattle, the “Rain City”, of all places, are magnificent and make for some fantastic photographs. Overlooking the Olympic Mountains is one of Seattle’s most popular leisure parks – Golden Gardens Park. Sunsets here are so breathtakingly gorgeous that crowds often get together to bask in the wondrous beauty of it. Add to this the tranquil surroundings, clean beaches and boats gliding by with sails flapping jauntily and you have the makings of a photographer’s dream. A number of hiking trails around the park complete this picture and allows for a veritable cornucopia of angles to choose from. Golden Gardens Park gets a definite thumbs-up for sunsets. This is the spot where many of Seattle’s great Space Needle photographs have been taken from. At sunset, Mount Rainier is enveloped in a beauteous pink and violet hue with the Needle in the foreground. An inscribed plaque at the park really says it all. The glorious sentiments in the plaque attribute its charm to the selfless efforts of Mr. and Mrs. Albert Sperry Kerry. Here, not only sunsets but also sunrises, are a dream for photographers wishing to catch nature’s evanescently scenic moments. This is truly a gift for the photographer. Alki Beach is one of the best spots for sunset views in Seattle. Around Alki Point one finds the lighthouse and just to the southeast lies the Benton Place retaining wall and Constellation Park & Marine Reserve, to name but a few. 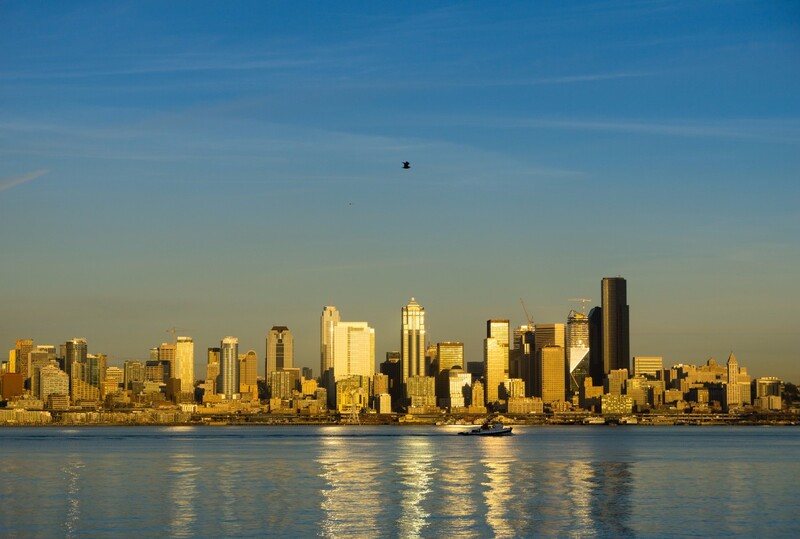 Some very iconic photographs of the Seattle skyline and the Olympic Mountains have already been taken here. Catch the sun going down as ferries cross the Puget Sound waterways or near the water taxi drop-off next to Marination Mai Kai. Situated on a little strip of land on Lake Union north of Downtown the Gas Works Park is another great spot for photographing stunning sunsets. As the name suggests, it is an actual former gas plant turned into a wonderful picnic spot. Kite Hill, where kite-flyers abound offers some fantastic scenes and is for this very reason, often chosen by couples getting married as the ideal spot for their big day. Water scenes and clear views of the Seattle skyline make this a spot worthy of investigation by the discerning photographer. Owned and maintained by the Seattle Art Museum, the Olympic Sculpture Park offers great views of Puget Sound and the Olympic Mountains. Catch fantastic sunsets here as eagles soar overhead. On a clear day, Mount Rainier is visible and makes for wonderful views. A Seattle sunset combined with the stunning outdoor sculptures found here is something that stays with you for a long time. There is nothing like being in an art-inspired setting to get one’s creative juices flowing and getting the best out of yourself. 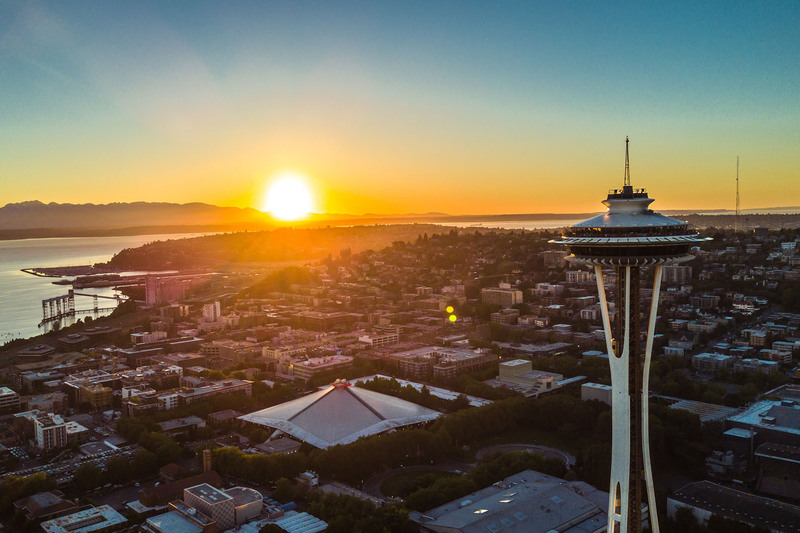 So, if you’re looking for some great sunset views in Seattle, you know now where to find them!